Original report: Solar activity is declining—what to expect? For the time being the temperature stopped. The temperature has responded to the increase in strength of the solar wind in 2014 and 2015. It starts inhibition in the south polar vortex. This pattern matches the model I developed in 2007 almost exactly. hunter: NOAA forecast (red line). Predicted ‘low’ for sunspot numbers from December 2018 onwards (to Dec. 2019) is zero. …. as NGOs such as Greenpeace, FOE and WWF are fond of telling us all that banning CFCs was some kind of envrionmentalist victory as remarkably the ozone thinning over the poles has gone into reverse, and ozone has been thickening up. What the NGOs have always avoided is that it is the solar wind that thins the ozone over the poles by redistributing it elsewhere. It is not a hole – that is hype. They conned the politicos into banning CFCs and manufacturers of fridges and the new patent for them made a bucket of money – and no doubt the NGOs were rewarded. If not they were able to boldly proclaim they had changed the atmosphere – and earn credos from the faithful (which they still do even though the science behind ozone depletion is now well understood). Those graphs have been linked to countless times (for years), so it’s certainly not the case that enlightened parties are just waking up. 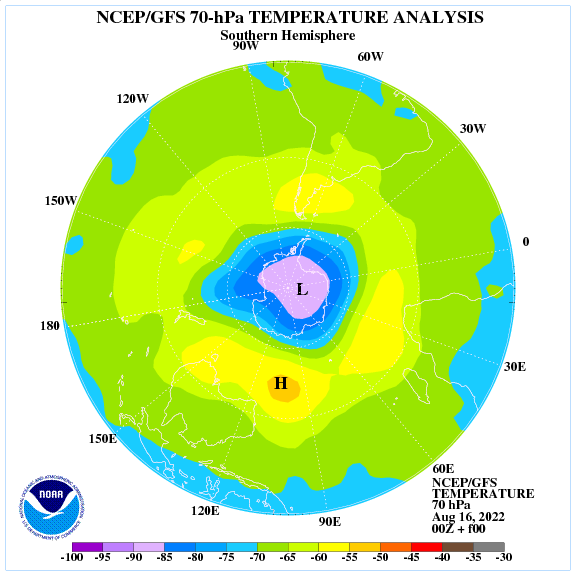 More likely they’re re-running narrative control to remind the alarmists that ozone oscillations are natural. Below is my reasoning with Willis and Leif ,and people that hold their view which is a solar/climatic connection is not seen when one looks at the data. They are of course wrong because they do not have the ability or desire to look at the overall big picture or appreciate lag times which have to be appreciated when viewing a solar /climatic connection. In addition interpretation of data plays a role and many do not want to accept the standard non manipulated data which by the way shows since the Holocene Optimum some 8000 years ago the global temperatures of the earth have been in a gradual down trend with spikes of warmth from time to time within this trend. The recent warm spike from 1845-1998 being no exception. 1. all solar minimum differ as was the case recently with the 1996 solar minimum versus the 2008-2010 solar lull, which effects the climate in a different manner. Coronal holes can keep the solar wind elevated long after sunspots diminish which can keep full solar climatic effects at bay. It is more complex old brew look at the latest data. I expect the lower stratosphere to continue to cool overall but the polar lower stratosphere not cooling as much as lower latitudes which should give rise to a more meridional atmospheric circulation as the prolonged solar minimum continues all other items (qbo for example) being equal. The upper stratosphere will probably warm due to the absence of strong solar events such as CME’s ,PROTON EVENTS ECT., which diminish ozone. The 11 years is only a half-cycle really. The full magnetic cycle is 22 years or maybe ~22.1y as an average, although very few if any cycles are right on the average. As we’ve had at least a century of mostly ‘below-average’ cycles in terms of their duration, it’s not surprising we’re now going to get at least one, almost certainly 2 and probably 3 longer cycles, which tend to have lower sunspot activity. All very interesting. “But” there is that word again. “Sun” , a small variable star that we depend on. In a medium size galaxy, with “winds” from other stars, but, like Sagan said, we are made of, but I call it star *hit. To me it is a lie to say 1percent variation is of no consequence. Especially of our nearest star. 1 percent can boil us or freeze us. Cause our plants to produce or starve us out of existence. 1 percent of a million degrees is more then 400 degrees Celsius, with that variation, what would survive? So we have an atmosphere, water, magnetic field, and other modifiers, that ammeliate that difference, and we call that climate? Pluto, has an atmosphere, and the rest, but is it habitable? It’s within the 1 percent of the distance to the next star. And has a climate. Another thing not mentioned is orbit, and inclination, and interception of plasma, from the sun, which is induced by the magnetics, kind of like electric universe, but the magnetic lines enclosing and stirring the pot of the sun. A couple of years ago, while arguing online with an AGW supporter about the influence of solar variation on Earth, he insisted that since current ssn numbers were roughly the same as at the early part of the 20thC, the planet should be at the same temp. Leif also uses this argument occasionally which I think is beneath him but who am I to say. Anyway, out of interest I averaged the ssn over thirty year periods since it seemed to me that lag times/residuals would spill from once cycle to the next. It also happens to be the magical ’30years is climate’ used by many. The results were interesting and generally supportive of a strong solar component to the 20thC warming. I’m guessing this must have been done many times before by folk here with considerably better math skills than me. Is there an old post on this? The lukewarmers really really hate the idea of a solar link to climate as the attack on Dr Nir Shaviv shows. See his Sciencebits(DOT)com especially The Ocean as a Calorimeter. Salvatore Del Prete has done a lot of work on a solar connection, So has Dr Norman Page. The papers are listed by topic to make them easy to use as references. I have lots of fun with them if I run into an Alarmist who insists that ONLY peer-reviewed papers count. They are also worth reading. It is a survey of the Quaternary science literature. (Paleo-climate) and makes the idea of CAGW completely laughable. Aside from that use the search feature upper left part way down.